Nikon cameras have lots of fans between both amateur and professional photographers. The brand provides such a huge variety of models and accessories, that it makes it really easy for you to start taking quality pictures, irrespective of the experience or training you have in the field of photography. However, as soon as you download the first set of photos made with your brand new Nikon D800, for example, you might notice they come in a format that your PC can’t decide how to open. The NEF image format is not supported by most regular viewers, and you might also notice it uses a lot of space on your hard-drive. The .NEF extension is used for the RAW images created using Nikon digital cameras. Most photographers opt for taking RAW images because they imply minimally processed data, so they allow computer editing and let you customize your image the way you want. But on the other hand, they are difficult to send by e-mail, print or store, due to their enormous size. Moreover, in order to view them, you need an advanced graphics editing program, such as Adobe Photoshop. So how can you make you .NEF files easier to handle? Some people think it’s enough to rename them and change the extension to .JPG, for example. But if you have tried this, you surely noticed it doesn’t work. 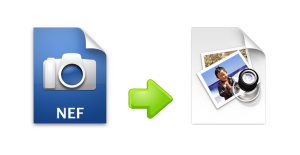 In order to change the extension of your image from .NEF to a more accessible format, such as .JPEG, .PNG or .TIFF, you need to convert your image files. Load one or more .NEF files and then choose from the large variety of editing tools available. 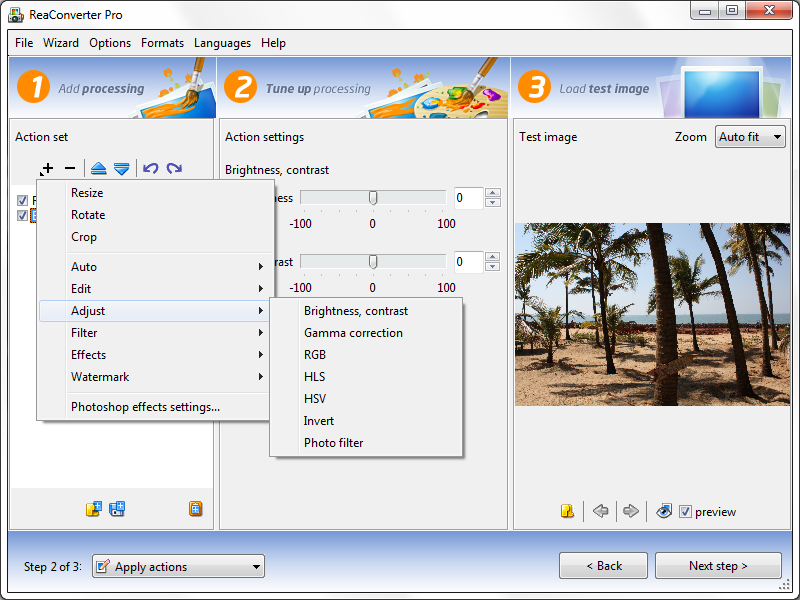 ReaConverter provides you with basically all the image processing options you might need. For example, you can create a reflection of your image, either horizontally or vertically, by choosing the Mirror option; you can crop the undesired part of your photo; or you can edit the width and height of your output image by choosing to resize it. ReaConverter also allows you to enhance the quality of the output image by removing “noise” or adjusting the color resolution. Choose an accessible format for your output image. 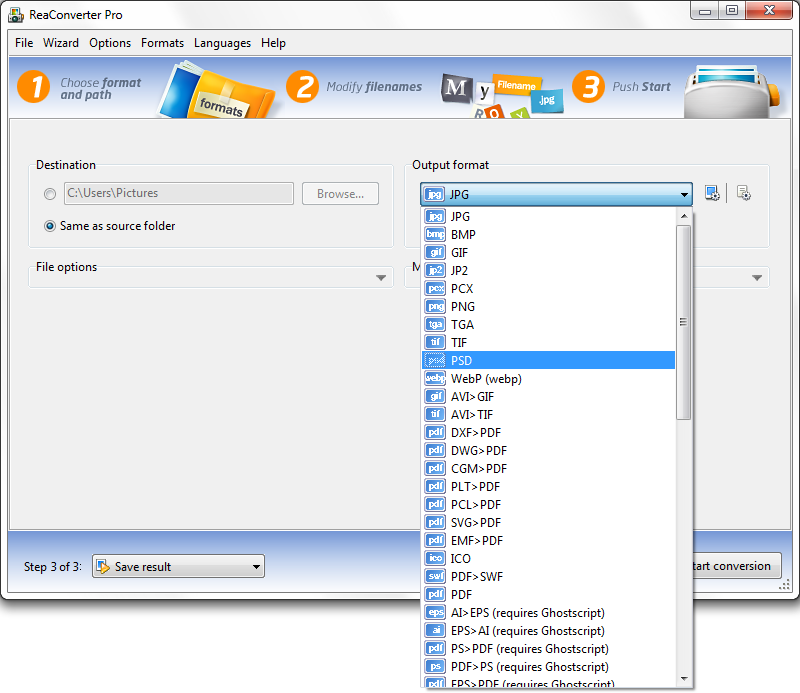 .JPEG, .TIFF and .PNG are the most popular options, but others are also available. Then simply press the “Start conversion” button and your .NEF images will automatically be transformed into a format you can visualize, store, send and print more easily. This entry was posted in Image conversion, RAW formats and tagged converter, image, jpg, nef, nikon, photo, png, tiff on February 1, 2013 by reaconverter.